Here are three professional books that I have written that may be of interest to teachers. I don’t have an image for Teacher Renewal: Professional Issues, Personal Choices, edited with Judith McConnell Falk, it looks at those things that erode a teacher’s desire to work with children or youth, share love a subject, and/or make the world a better place. It is no longer in print, but can be found on-line and as a used book. It’s still a good read. Living Faithfully: The Transformation of Washington School (Information Age Publishing, 1992) is the result of a almost ten years of historical and ethnographic research in a small town in Western Oklahoma. It explores prevailing leadership theories in light of the normative question of what is good, true, right, just, beautiful, and holy. It is not the vocabulary of current education policy, but it describes what most families want for their children: an education that is value-able. Growing Up Caring: From Personal Knowledge to Professional Practice follows a young teacher from the time she entered into the teacher preparation program at Teachers College, Columbia University through her eighth year of teaching. 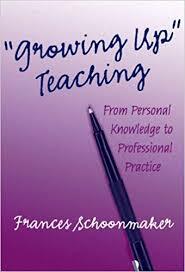 It considers the things that make a good teacher, concluding that exploring personal knowledge, critiquing it, and integrating it with professional learning and experience is critical in preparing thoughtful, innovative, and effective teachers. The textbook, Growing Up Caring, published by Glencoe/Macmillan in 1990 is still available on line, though at wildly varying prices. It was the first of its kind, focusing on helping young people to think about the values that underpin their relationships at home, in school, with friends, and in society.